Get Comfort and Cooling For All Of Your Outdoor Areas. 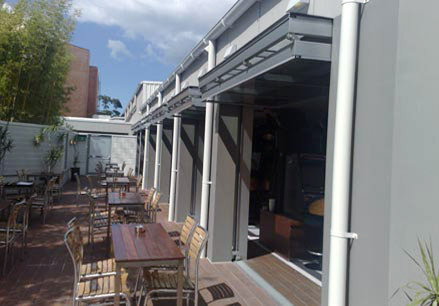 On hot days outdoor cooling is a must have – to keep patrons happy and comfortable. If you have a restaurant, café, veranda, or other type alfresco area – you know that customers will not stay if it is too hot. If your business has space for a smoking area, gaming area, patio, or other outside place that needs cooling – your search for the right application to do the job is over.High-pressure cooling systems, which make use of mist cooling, or fog cooling – are the preferred way to effectively cool these places. 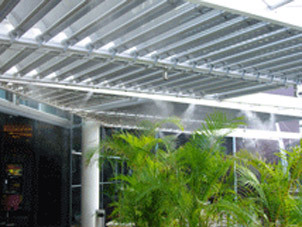 Evaporative cooling for outside use is the number one method utilized all throughout Australia. Many outdoor clubs, café s and other venues utilize mist and fog cooling to keep temperatures down to an acceptable level. We have a long list of customers who have made use of our systems to maintain optimal cooling for their outdoor areas. We can configure the exact cooling application to best suit your needs using our state-of-the art mist and fogging system. As these droplets flash evaporate and vaporize into the atmosphere, there is a heat exchange causing a noticeable drop in ambient temperature. When the droplets flash evaporate they do not leave a wetness upon the floor or furnishings. This is less dangerous than the low pressure systems which leave hazardous wet areas that could cause an accident. We have been serving the businesses needs in this area for years, and we can customize your order to do exactly what you need it to do. You Can Relax In Comfort or Even Eat Outdoors While Letting Your Mistafog System Keep the Temperature Up To 15 deg C Cooler. Cooling is as essential as heating when it comes to comfort in the hospitality industry. People expect to be comfortable when they are making visit to a paid establishment. 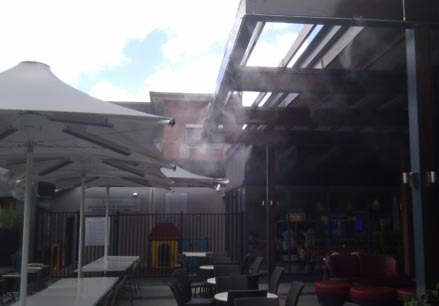 Don’t allow excess Heat and Bugs to spoil your BBQ or drive customers away from your outdoor cafe or restaurant. It is hard to take when having an outdoor event – to see customer after customer heading to their cars and leaving to – escape the heat. Repel those pesky flies, wasps, or other insects that would normally ruin your customers day. By adding a very small dose of natural insect repellant to the fog, you can achieve the dual benefits of reducing the ambient temperature and driving away annoying and biting insects. Fix your cooling problem today – and let a representative from Mista-Fog provide you with a specific quote. It will be customized to apply to your unique specifications. Our years of experience, and long list of satisfied customers – stand as a testament of what we can do for you.